Double iPet Portraits seem to have been the order of the year this summer. I have been really pleased to have completed 3 this summer. 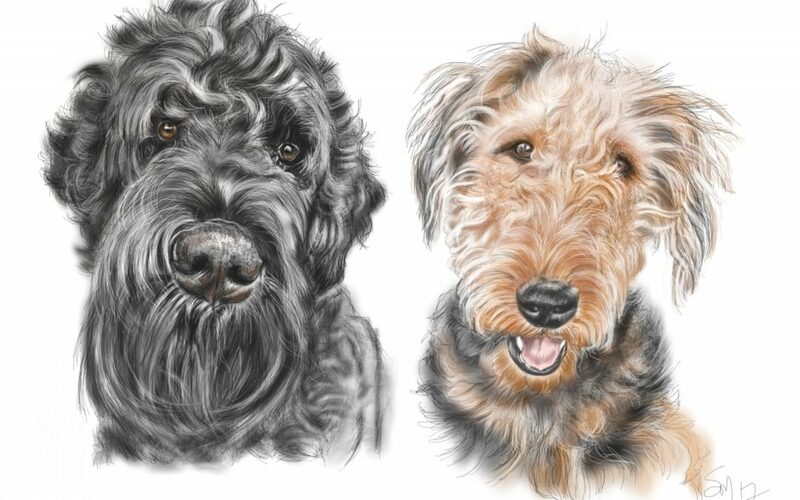 Firstly for a lovely couple I met at Downton Cuckoo Fair who had sadly lost a very treasured Airedale Terrier but now have an equally gorgeous Black Russian Terrier, ‘Bear’, and he lives up to his name, he was quite a big dog! Thank you Neil and Debbie! 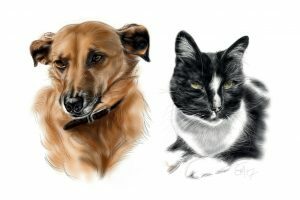 Really pleased you liked the artwork, I’m sorry the printing wasn’t what you thought it might be, but at least you have the artwork to be able to print in on other mediums. Then, for a last minute birthday idea for a very lucky wife who I’d met at a ladies night, I met her husband at a Winchester Business networking group ‘First Friday’ Thank you Adam! So glad I was able to complete in time and the printers too did a great job of getting it printed onto canvas within a few days. 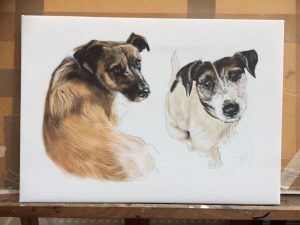 Finally I met another lovely client at the New Forest Show who resides in the USA but wanted a present for his parents. We conversed via email to finalise the artwork and discuss composition for the printers. The printers are able to print together from two separate iPets. I posted to his parents and they were really pleased. Many thanks Chris! Have shown in this last picture the actual print, A3 canvas.